It is advisable to sealcoat your parking lot once every couple of years. Sealcoating your parking lot at this frequency will double your lot’s useful life. Perhaps most importantly, it will save you money as you will spend less on repairs and delay a full replacement far into the future. Sealcoating an asphalt parking lot protects this sensitive space in a number of ways. Sealcoating serves as a protective barrier against the sun’s nasty ultra-violet rays. This protection preserves your parking lot’s strength as well as its flexibility. 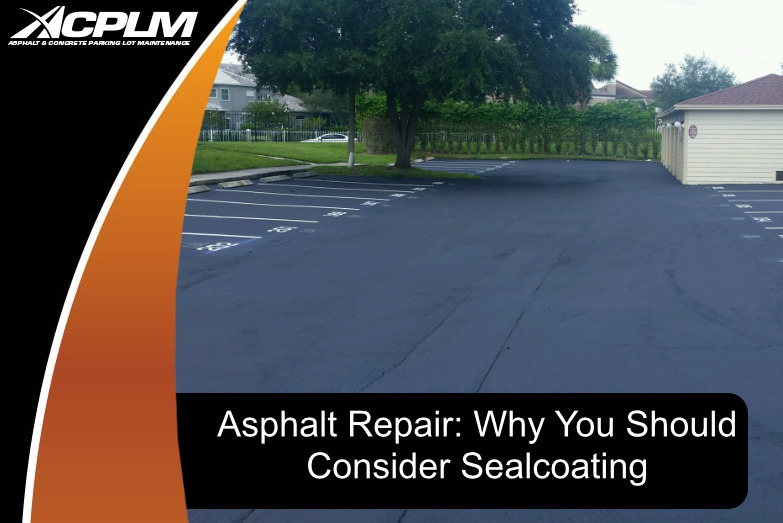 The failure to sealcoat an asphalt parking lot will let the sun’s rays spur the formation of cracks that allow water to seep down below and cause all sorts of problems like cracking and potholes. A parking lot that hasn’t been sealcoated will also endure deterioration from oil and gas emitted by automobiles. This exposure and gradual deterioration create a compromised parking lot that appears unkempt and aged. The performance of the sealcoating depends on a number of factors. The surface must be properly prepared. Furthermore, weather conditions also play a part. The temperature of the surface air should be at least 50ºF. The sealer will not be applied if rain is expected in the next 24 hours. In terms of curing, humidity and temperature are of the utmost importance. Curing will require at least 24 hours. Once this time period has passed, vehicles can traverse the surface. Our sealcoating services are considered the best in Florida for good reason. We understand just how important your asphalt parking lot is to your property’s functionality, aesthetic appeal and safety. ACPLM relies on the widely-acclaimed GEM Seal for most of our asphalt sealcoatings. Ask around and you will find ACPLM earns its keep. Our customers are satisfied with the quality of our work to the point that they recommend our asphalt repair services to other business owners and managers. Reach out to our sealcoating experts for a no-cost consultation and estimate. Our team has more than half a century of industry experience. We are the fully insured, licensed and bonded asphalt repair business you have been looking for. If you own or manage a property, your parking lot can benefit from sealcoating. Let our parking lot gurus get to work on sealcoating your lot and the surface lifespan will be elongated. Your property will have improved curb appeal and you will enjoy an uptick in business. The failure to sealcoat your asphalt parking lot can result in damage caused by harmful UV rays, vehicle oils/gases, and water.